Calexico On Mountain Stage In the group's second appearance on Mountain Stage since 2003, Calexico played a set of songs from its latest album, Carried to Dust. The band's robust, dynamic sound — driven by two trumpets, pedal steel, bass and piano — incorporates many ethnic influences. 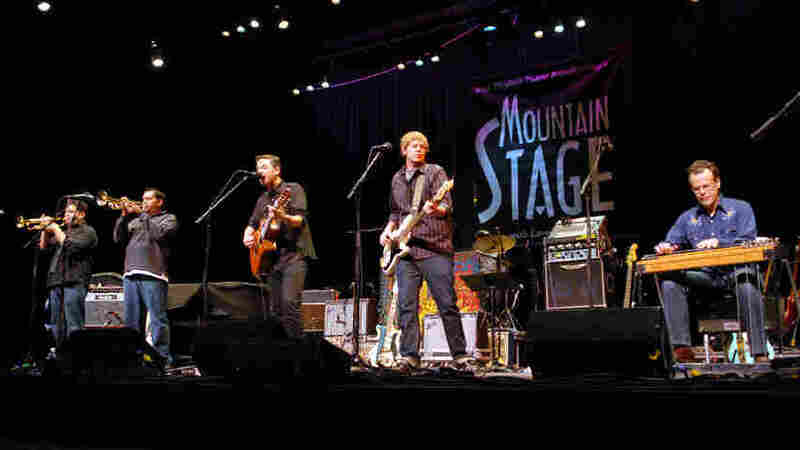 Calexico performed on Mountain Stage. Started by singer-guitarist Joey Burns and drummer/multi-instrumentalist John Convertino, the Arizona-based band Calexico has evolved throughout its 15-year career. In the group's second appearance on Mountain Stage since 2003, Calexico played a set of songs from its latest album, Carried to Dust. The band's robust, dynamic sound — driven by two trumpets, pedal steel, bass and piano — incorporates many ethnic influences. Carried to Dust features guest spots from Pieta Brown, Bo Ramsey, Iron & Wine's Sam Beam and Jairo Zavala of the Spanish band Depedro. Calexico is already on the bill for several festivals this summer, including Foro Sol in Mexico City and Bonnaroo in Manchester, Tenn. This segment originally ran Apr. 12, 2010.